Both the Vintage Fiesta covered marmalade and mustard jars were in production for a short ten years, from mid 1936 to mid 1946 (with red being discontinued in early 1943). The larger marmalade was originally designed as the mustard, but someone at Homer Laughlin must have had the forsight to see that was an awfully large jar for mustard! 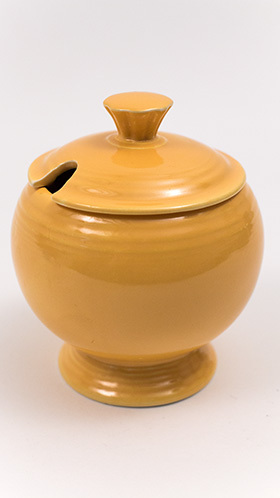 Attention turned to the design of the mustard, which after numerous revisions was finalized and then the marmalade (originally named the honey jar) was finished. The bodies of both would have been slip cast holloware with the seams smoothed by hand. The finial would have to be hand applied to the marmalades and the lid worked on the jiggering machine to add those bands of concentric rings we love so much. The spoon slots would have been punched by hand from the lid before the clay dried. Marmalades will be marked in the mold. Both pieces are scarce and hard to find in good condition. It is speculated that they were either speciality items or not big sellers since they appear to be quite scarce. 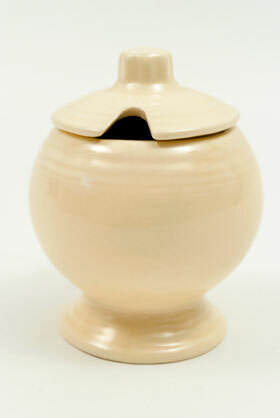 Circa 1936-1943: The vintage Fiesta covered marmalade jar was added to the line in mid 1936. 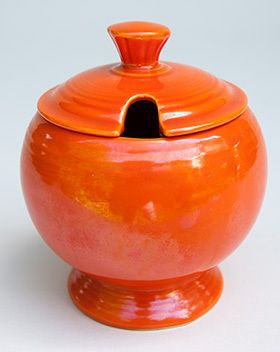 Slip cast from three pieces with the finial hand applied, the lidded marmalade is hard to find and a delight to add to your collection. 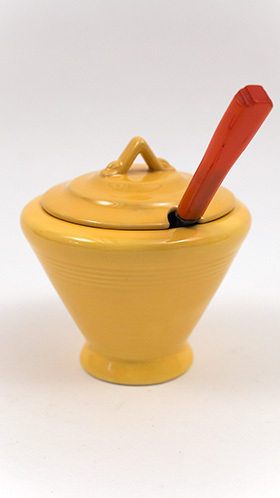 Circa 1936-1946: The vintage Fiesta covered marmalade jar was added to the line in mid 1936. 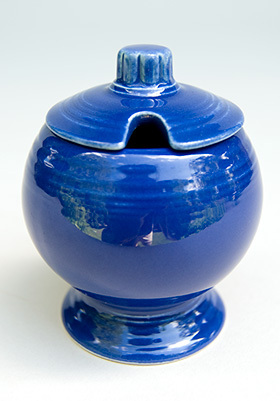 Slip cast from three pieces with the finial hand applied, the lidded marmalade is hard to find and a delight to add to your collection. Orignally called the "honey jar", the vintage Fiesta marmalade was deemed to large for its original pupose as the mustard jar and was released 1/2 a year later as the Covered Marmalade Jar. Very hard to find, especially in excellent, undamaged condition. 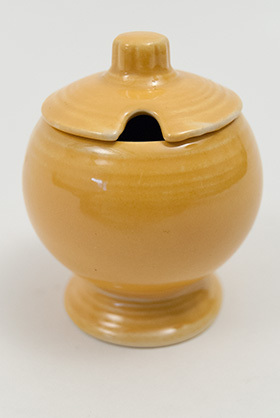 Circa 1936-1946: The vintage Fiesta covered marmalade jar was added to the line in mid 1936. Slip cast from three pieces with the finial hand applied, the lidded marmalade is hard to find and a delight to add to your collection. Circa 1936-1946: Orignally called the "honey jar", the vintage Fiesta marmalade was deemed to large for its original pupose as the mustard jar and was released 1/2 a year later as the Covered Marmalade Jar. Very hard to find, especially in excellent, undamaged condition. Circa 1936-1943: The red fiesta mustard was only in production for seven years and will prove hard to find, especially in excellent condition. 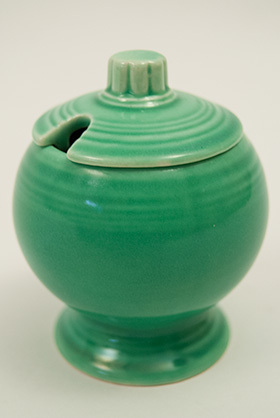 The base and lid were slip cast and the lid was molded from one piece, just like the medium sized teapot. The spoon hole would have been cut out by hand after the piece was molded. This example has the makers or the inspectors mark "ER" stamped in the dry foot on the base (incidentally this is the only piece I have seen with the mark in the dry foot instead of the glazed body). Circa 1936-1946: In the quest for perfection, HLCo designed three mustards before finalizing the size that seemed just right for the mustard jar. 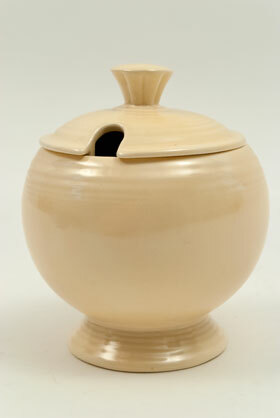 The base and lid were slip cast and the lid was molded from one piece, just like the medium sized teapot. The spoon hole would have been cut out by hand after the piece was molded. 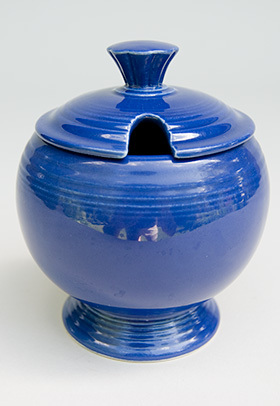 Circa 1936-1946: Original cobalt blue Fiestaware mustard jar in excellent condition. Unmarked, as all mustards were. Stands at a tall 3 1/8". Circa 1936-1944: The original green fiesta mustard was only in production for eight years and will prove hard to find, especially in excellent condition. 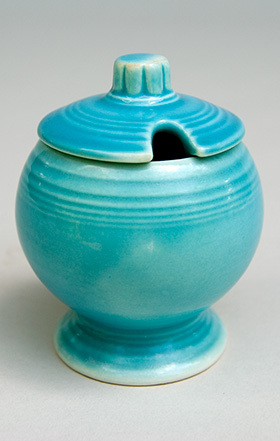 The base and lid were slip cast and the lid was molded from one piece, just like the medium sized teapot. The spoon hole would have been cut out by hand after the piece was molded. The mustard jar went through many revisions before this final size and design were decided on and the piece was released at the end of 1936..
Circa 1936-1944: In the quest for perfection, HLCo designed three mustards before finalizing the size that seemed just right for the mustard jar. Stands at a tall 3 1/8".Produced for 10 years, not easy to find. 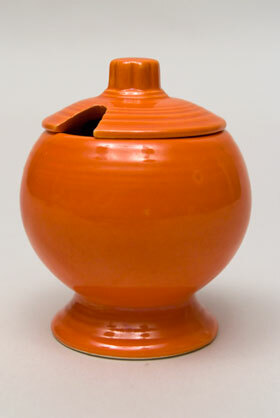 Circa 1938-1941: The marmalade is a great example of the more unusual holloware pieces from the Harlequin pottery line. 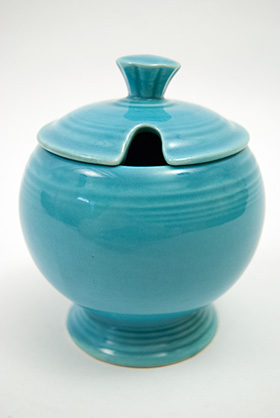 A hand applied, art-deco inspired, handle adorns the lid atop a simple, conical body. 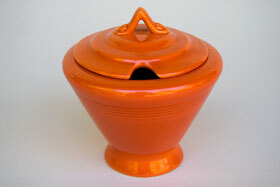 One of the first five pieces dropped from production, the vintage Harlequin pottery marmalade is a collectors dream. This example in the original spruce glaze is in excellent condition with no damages, touchups or repairs and is an unusually good application of the pesky spruce glaze. 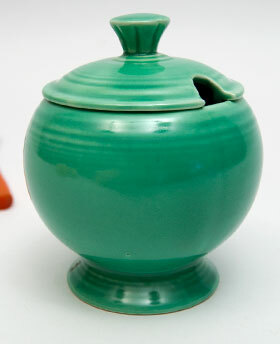 Circa 1938-1941: The marmalade is a great example of the more unusual holloware pieces from the line. 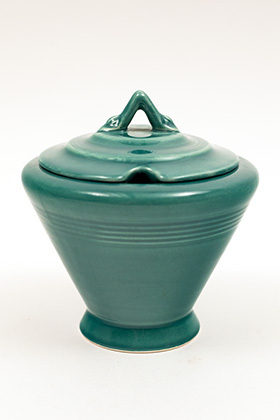 Hand applied, art-deco inspired, handles adorn the top of a simple, conical body. One of the first five pieces dropped from production, the vintage Harlequin pottery marmalade is a collectors dream. Circa: 1938-1942: One of the original four colors for the Harlequin line, one one of the most desirable pieces of holloware. Short lived piece - hard to find and in excellent condition. Circa: 1938-1942: The Harlequin Marmalade remains one of the most elusive pieces of the line. Hard to find in any color. 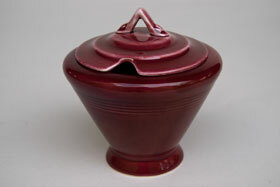 This example in the early red glaze is a great find.